Yesterday I announced the release date for my next novel, Red Litten World. I also released a sample chapter, which you can read here, and you can already preorder it on Amazon. Really looking forward to getting this out in the hands of my readers. I think you’ll love it. Kari-Lise’s latest solo show opens next weekend at Modern Eden Gallery in San Francisco. The show runs September 12th through October 3rd. (We’ll, be there opening night. If you live in the area come on by and say hello.) In this post, High Fructose highlights many of the pieces from the upcoming show. After watching this series develop over the last six months, I’m excited to see it out in the wild. I’m really proud of her. I’m sure you’ll agree, this recent series is absolutely gorgeous. What If Edward Gorey Illustrated Lovecraft? John Kenn Mortensen is a Danish illustrator and children’s television producer whose illustrative style is reminiscent of Edward Gorey. Lovecraft eZine editor-in-chief Mike Davis looks at some of Mortensen’s more Lovecraftian illustrations. I thought these animated gifs were pretty charming. Artist Segawa thirty-seven takes old woodblock prints and with the use of technology adds a bit of animation. They’re fun. You can see more work here. I am an enormous fan of Ken Burns. (Seriously. Ask Kari-Lise. It’s a problem.) Recently PBS has released an HD version of his The Civil War documentary series. (If you haven’t seen it, watch it, it’s incredible. I’ve watched it at least ten times.) Included with the HD update was an update to the wonderful maps used through the series, some of which you can view here. I’ve been reflecting and researching the American Civil War a lot over the last few months. I thought this write-up from The Atlantic explaining the Confederate cause with their own words was poignant. Next time someone tries to tell you the war wasn’t about slavery, send them this. I’m not going to tell you a thumper and I hope this post isn’t too high for anyone’s nut, but the bottom fact is these old slang terms are some pumpkins. Heck, you could say the whole post is a lally-cooler. A student befriends a strange old musician who plays a viola da gamba and discovers that his otherworldly rhythms and melodies are more than they seem and could lead to some terrifying places. This work is just way too awesome not to show you guys. Make sure you click to see it all enormous. It’s incredibly detailed and a little bit creepy. 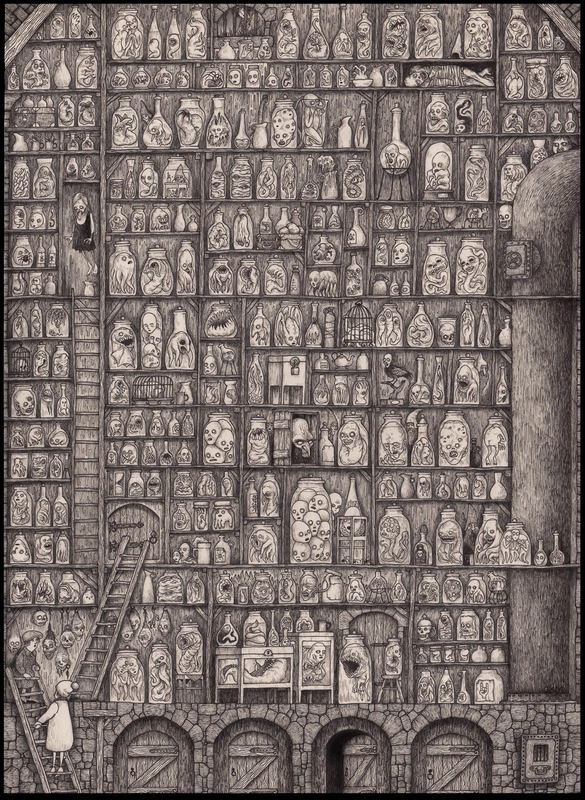 Check out more of John Kenn’s work here. He has an Edward Gorey vibe I really dig. Want more content like this? Sign up for my newsletter: The Telegram. It’s packed full of reading recommendations, news on my books, interesting links, and more. Sign up today!